Figure 3.17. Both true cord hemorrhages and artifactual ones have a similar appearance on cross-section. The blood often tracks for considerable distances along the vessels. In problematic cases, multiple microscopic sections from the area may show vital changes. decreased fetal movement (oligohydramnios, arthrogryposis). They are also associated with more problems in neurological development, suggesting the associated infants may have had longstanding in utero problems compromising mobility. Because of these associations, it is extremely important to measure the entire cord length, including that left on the baby or taken for cord gases. Ideally this is done in the delivery room. Premature infants tend to have thicker umbilical cords than more mature babies, while cord substance is often lacking and cords are thin in utero-placental insufficiency. Edema of the cord can be impressive. It is inconsistently seen in a variety of pathologic states (Figure 3.16). Isolated areas of true cord stricture also occur, particularly near the fetal body wall and at the placenta cord insertion (Figure 3.17). The insertion of the cord into the placental disk occurs in a variety of sites. It may be into the placental substance or into membranes. The position of insertion is due to the plane of implantation of the conception and/or differential placental growth from uterine conditions. Placentas with velamentous vessels are particularly important to evaluate and document, since such vessels can be associated with compression or rupture (Figure 3.18 to Figure 3.25). While these are usually seen with velamen-tous insertions, small membranous vessels can be present along the edge with normal insertions. Figure 3.18. 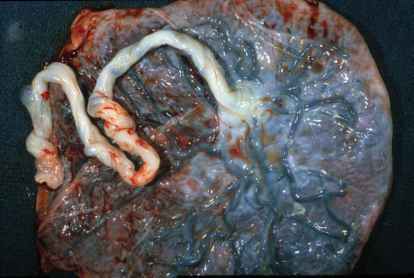 Marked edema is present in this umbilical cord.The vessels become cordlike strands within the very loose Wharton's jelly. While such edema may be seen with a variety of perinatal diseases, it is most often an impressive incidental finding. Figure 3.19. 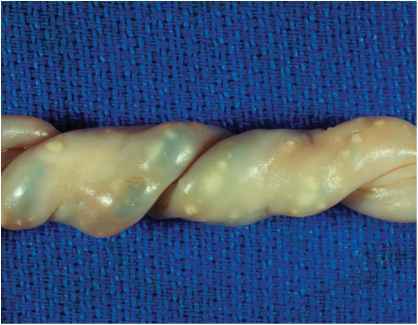 This cord becomes narrowed near its insertion into the placenta with reduced Wharton's jelly. Differences in diameter are common along the length. It is usually wider close to the infant. Strictures which are physiologically significant often show microscopic thrombosis. Figure 3.20. Most placentas will have a cord insertion in the center or slightly eccentric in the disk, the latter shown here. The surface vessels disperse from the cord in a relatively even circumferential manner. Even when the cord has been torn from the placenta, examination of the distribution of surface blood vessels usually reveals the site of insertion. Figure 3.21. This cord inserts close, but not quite at the margin of the placenta. The vessels course in one direction away from the cord. 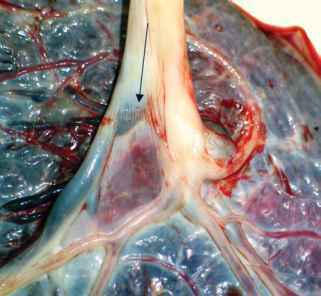 Such a vascular distribution is found in 38% of placentas and is likely somewhat less effective in perfusing the fetus. Figure 3.22. A true marginal insertion is present (Battledore placenta). Membranous vessels adjacent to marginal cord insertions are common. Marginal and velamentous cords may be less mobile and more prone to compromise. The infants are slightly smaller on average. In many of the very peripheral insertions, there are a reduced number of fetal surface vessel branches. Figure 3.23. 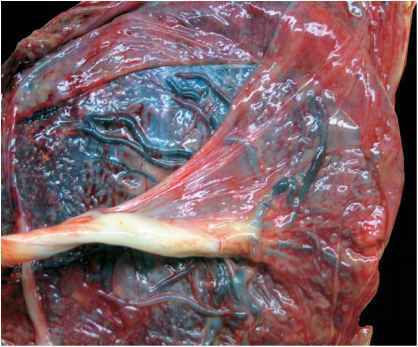 Cord insertion into the free membranes (velamentous insertion) occurs in about 1% of deliveries. The vessels must be carefully examined for integrity and extent of membranous passage. Old hemorrhage behind the membranes is sometimes found where the cord attaches. Intrapartum rupture of a velamentous vessel occurred in this case (arrow) supported by maternal history and neonatal anemia. This infant survived. Hemorrhage from a ruptured vessel is usually found in the sub-amniotic region. Vessels may also be torn after the infant has been born, during placental delivery. While this has no clinical significance, it should be noted since complete historical information may not be available at the time of placental examination. Figure 3.25. 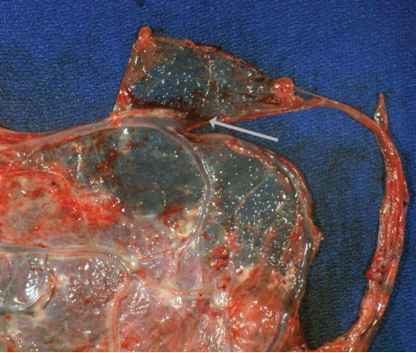 Despite the close proximity of the cord insertion and velamentous vessels to the site of membrane rupture in this vaginal delivery, no vascular disruption occurred. Vessels overlying the cervical os (vasa previa) are at the greatest risk of tearing and causing catastrophic fetal blood loss. 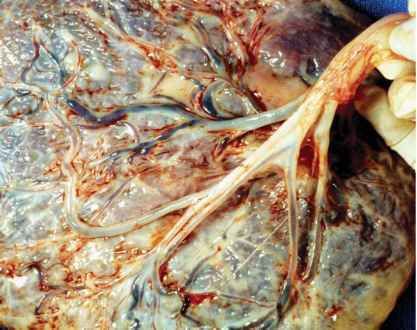 Velamentous vessels may also be compressed during labor. 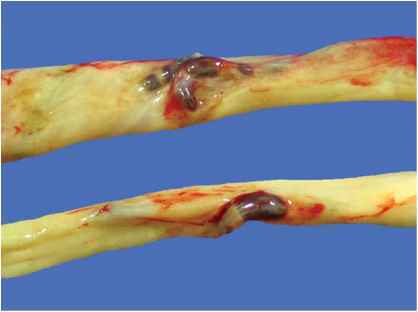 There is a fleck of calcium in one velamentous vessel which is likely old thrombosis (arrow). Figure 3.26. 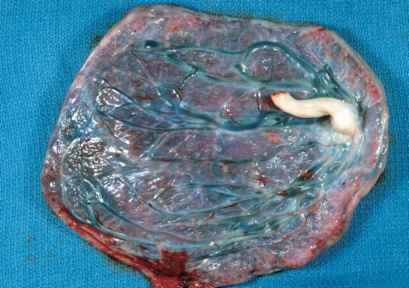 This cord divides into vessels which lose their protective covering of Wharton's jelly above the surface of the placenta. Such furcate insertions will have the risks attendant to velamentous vessels. The vessels in the cord may separate before it reaches the surface (furcate). The unattached surface amnion may also attach to the cord several centimeters before the cord reaches the placental surface (Figure 3.26 to Figure 3.29). Figure 3.27. 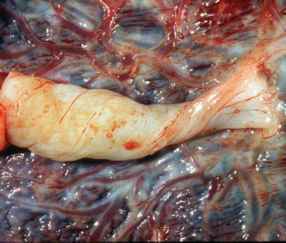 At times the cord is partially encased by a fold of amnion at its placental end, a "chorda" or amniotic web. This cord is minimally furcate with a web of amnion enclosing the vessels. A clamp mark is present (arrow). Amniotic webs are very common and can extend for several centimeters up the cord. They may be loose or relatively tight and bind the cord to the fetal surface of the placenta. If the amnion is largely detached from the chorion, a web is likely. Figure 3.29. A long tight amniotic web is present. Webs may limit the mobility of the cord, potentially compromising blood flow. There is also subamniotic hemorrhage. Although bleeding from vessels between the amnion and chorion is usually an artifact arising during placental delivery, it is common when webs are present, suggesting abnormal stress in this area. The cord inflammation seen with most ascending membranous infections (see page 56) is usually not recognizable grossly. 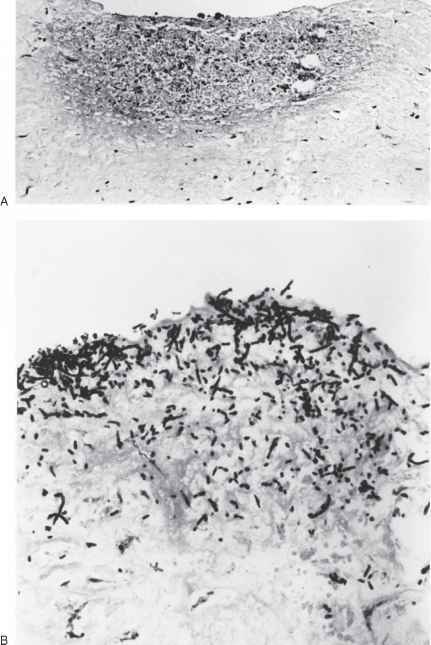 Candida is an exception and shows characteristic micro abscesses on the cord surface (Figure 3.30, Figure 3.31). This infection may cause a rash on the infant at birth. Scattered yellow to white 2-mm to 3-mm plaques on the cord are virtually pathognomonic of Candida funisitis. They are not seen elsewhere on the placental membranes. There is usually an associated chorioamnionitis. Figure 3.31. (A) Histologically Candida funisitis shows micro abscesses just under the cord surface. These are filled with necrotic debris, in which it is difficult to identify organisms, (B) numerous fungal pseudohyphae and yeasts are present on methenamine silver stain. It is more likely to cause sepsis in premature infants. The "barber-pole" configuration of chronic necrotizing funisitis is felt to represent a chronic and sometimes healed intra-uterine infection with organisms of low virulence (Figure 3.32, Figure 3.33). Figure 3.32. Necrotizing funisitis represents a chronic inflammatory process in the umbilical cord, apparently infectious in origin. There is calcification surrounding the vessels leading to an extremely rigid cord. This is at times visible along the length as a white stripe. Figure 3.33. Cross-section of a cord with necrotizing funisitis shows white bands suggesting diffusion rings surrounding each of the three vessels. These are composed of necrotic inflammatory cells and calcification. Loss of Wharton's jelly with ulceration of the cord surface is uncommon, but the associated infants may have significant problems. 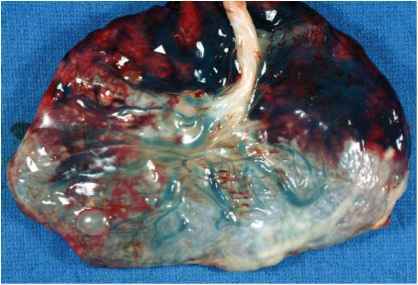 It is usually related to bile or meconium exposure (Figure 3.34). Figure 3.34. Ulceration of the cord occurs in some cases of upper gastrointestinal tract atresia. This infant had proximal jejunal atresia. The exposed vessels may hemorrhage leading to fetal compromise or death. The intestinal obstructions are located below the Ampulla of Vater as the bile, appears to be etiologic. Ulceration also may occur with longstanding meconium exposure. 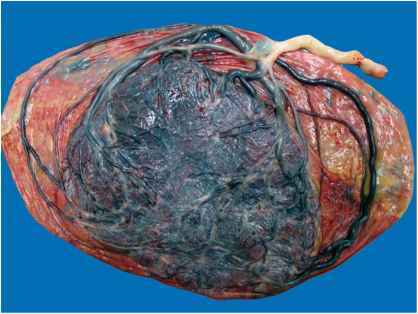 When vessels of cord seperate prior to insertion placenta? How to examine insertion point of umbilical cord?